We offer to Your attention of authors work and good of the bone of the mammoth, which in now I am in a presence and which you can purchase. Original souvenirs of hand made, every good exists in the unique copy. you can order master making of artistic miniatures of the bone of the mammoth on a sketch or on a picture, to placed in a section Sites of masters. Hallmarked author. Delivery in Ukraine by P.O. mail. Pendant of the tusk of mammoth "Dragon"
An artistic pendant of the fossil tusk of mammoth "Dragon". Natural color of tusk of mammoth. Master - And. Stepanenko, Ukraine, Kharkov. Individual handwork, screw-thread on the tusk of mammoth. Not to wet in hotter, to salt and salt water, to save from dryness and moisture. 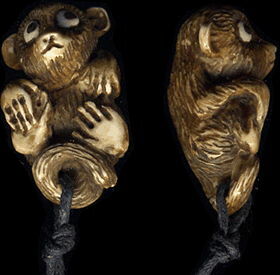 An artistic pendant of the fossil tusk of mammoth "Improvisation". Natural color of tusk of mammoth. Master - And. Stepanenko, Ukraine, Kharkov. Individual handwork, screw-thread on the tusk of mammoth. Not to wet in hotter, to salt and salt water, to save from dryness and moisture. Minityura of the tusk of mammoth "Monkey"
An artistic pendant of the fossil tusk of mammoth "Monkey". 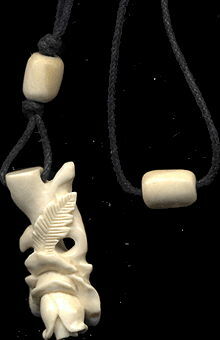 Hangs downward a head (in form pendant). Master - And. Stepanenko, Ukraine, Kharkov. Individual handwork, screw-thread on the tusk of mammoth. Not to wet in hotter, to salt and salt water, to save from dryness and moisture. On a turn is a brand of master. Necke. Artistic screw-thread on the tusk of mammoth. Individual handwork, screw-thread on the tusk of mammoth. Not to wet in hotter, to salt and salt water, to save from dryness and surplus of moisture. Artistic pendant in form rose of the fossil tusk of mammoth. Master - And. Stepanenko, Ukraine, Kharkov. On a turn is a brand of master. Individual handwork, screw-thread on the tusk of mammoth. Not to wet in hotter, to salt and salt water, to save from dryness and surplus of moisture. Necke. 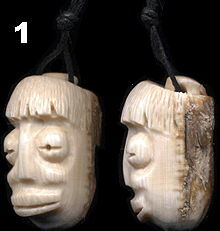 Pendant in form mask in African style, N 1 (size 32 x 16 x 19 mm) of the fossil tusk of mammoth, extracted from eternal frigidity. On a turn is a brown crust of tusk of mammoth, distinguishing him from an imitation. Pendant or accessory for fleshki, mobile telephone etc. Master - And. Stepanenko, Ukraine, Kharkov. Not to wet in salt and salt water, save from dryness and surplus of moisture (impermeable package). 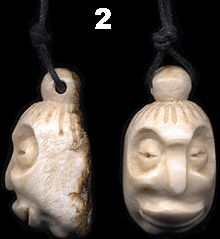 Pendant in form mask in African style, N 2 (size 34 x 19 x 17 mm) of the fossil tusk of mammoth, extracted from eternal frigidity. On a turn is a brown crust of tusk of mammoth, distinguishing him from an imitation. Pendant or accessory for fleshki, mobile telephone etc. Master - And. Stepanenko, Ukraine, Kharkov. 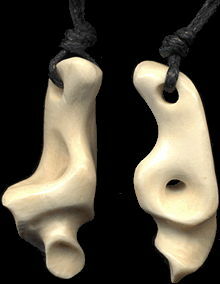 Pendant in form dog-tooth (size 32 x 20 mm, thickness 7 mm) of the fossil tusk of mammoth, extracted from eternal frigidity. Bilateral. Rare and noticeable. Master - And. Stepanenko, Ukraine, Kharkov. Settled to the export abroad through customs declaration (souvenir). 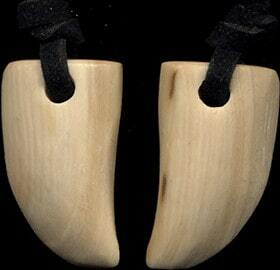 Pendant in form claw (size 35 x 15 mm, thickness 7 mm) of the fossil tusk of mammoth, extracted from eternal frigidity. Bilateral. Original. Master - And. Stepanenko, Ukraine, Kharkov. Settled to the export abroad through customs declaration (souvenir). 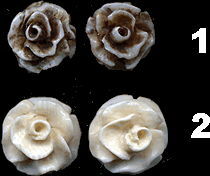 Serezhki-"gvozdiki" in form roses of the tusk of mammoth of the fossil tusk of mammoth. Master - And. Stepanenko, Ukraine, Kharkov. Handwork. 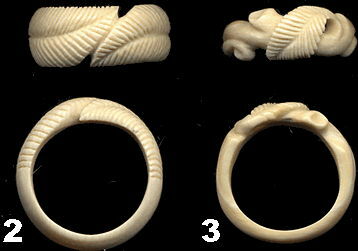 Insertion in form dog-tooth (size 28 x 15 mm, thickness 10 mm) of the fossil tusk of mammoth, extracted from eternal frigidity. Expressed pattern of tusk. 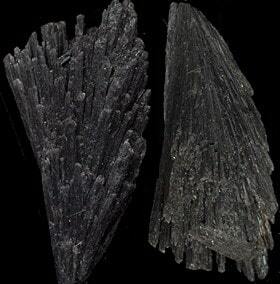 Figured long ear-rings (common length is 70 mm, thickness 3-5 mm) of the fossil tusk of mammoth, extracted from eternal frigidity. Handwork. 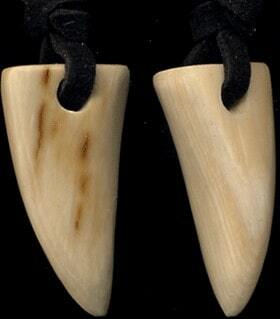 Pendants of author hand-worked in form dog-teeth of the fossil tusk of mammoth, extracted from eternal frigidity. Bilateral. Author. Master Alexander Stepanenko (Kharkov, Ukraine, CIS) professionally works on a screw-thread of the bone of mammoth (bone a mammoth) from 1974. His works are widely known on territory of CIS. Exclusive jeweller wares and womanish jewelry of the bone of mammoth. Exceptional on beauty, originality and handwriting of author netske, okimono, statuettes and miniatures of elephants, mammoths, different animals and exotic creations of the bone of mammoth.